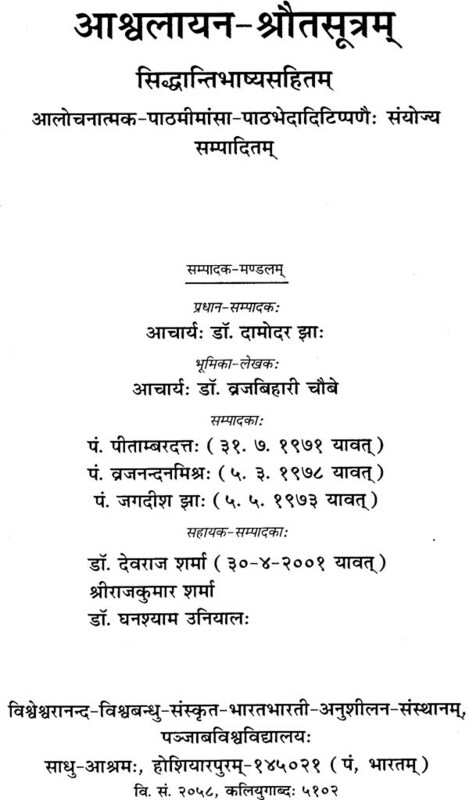 In 1938 only two chapter (1-2) only two chapter (1-2) of this work were published by Dr. Mangal Dev Shastri with the help of only 3 manuscripts. 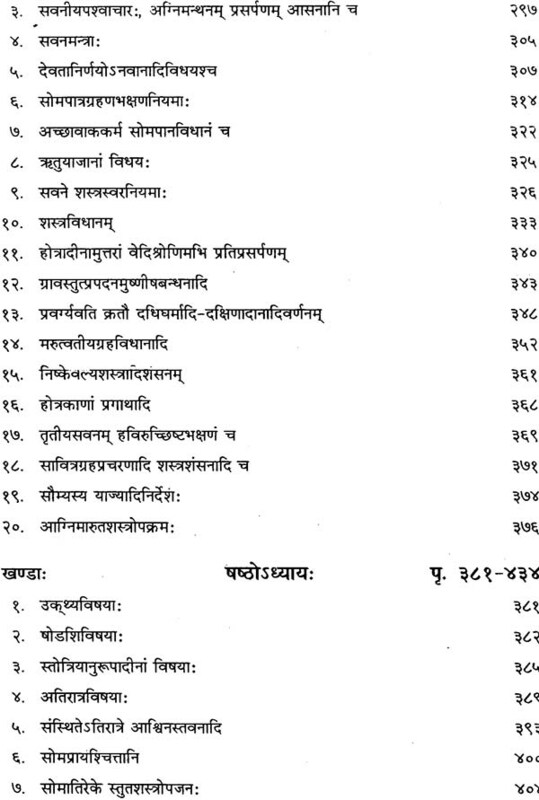 Afterwards Dr. Vishava Baudhu Ji started the project of critical editions of various Vedic works. 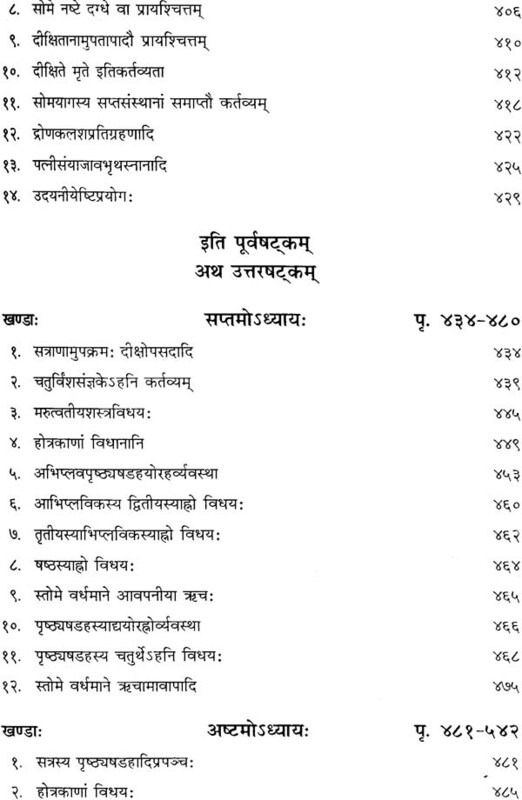 In this process the critical edition of the Asvalayana Srautasutra with with all available commentaries was taken up. There are 5 commentators on the Asvss Viz.. Devasvamin, Devatrata, Siddhantin, Gargya Narayana and sadgurusisya. The work on those commentaries went on up to collation of some MSS. But scholars, viz., Pt. Pitambar Datta, Pt. Vraja Nandan Mishra and Pt. Jagdish Jha went on retirement and work was stopped. 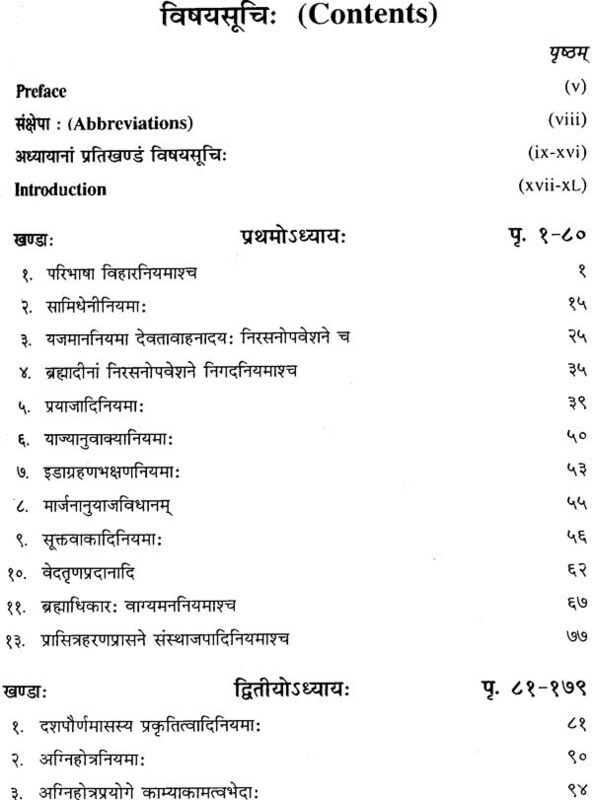 After a decade,w e took up editing of the Devatrata Bhasya on the Asvss. And it was published in 3 part in 1996. After the editing of the Devatrata-bhasya, we took up editing of the Siddhanti-bhasya and as a result this work is in your hands. 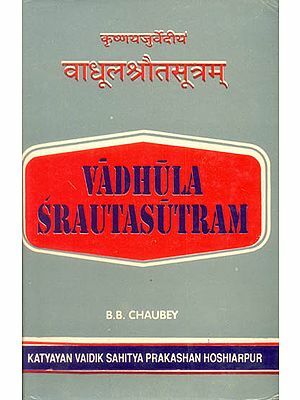 Among the Srautasutra related to the Rgveda and mainly dealing with the duties of the Hotr priest and his three assistants, viz., Maitravaruna, Acchavaka, and Gravastut, collectively called Hotrakas, today we have only two, viz., the Asvalayana srautasutra (asvss) and the Sankhayana Srautasutra (Sankhss). 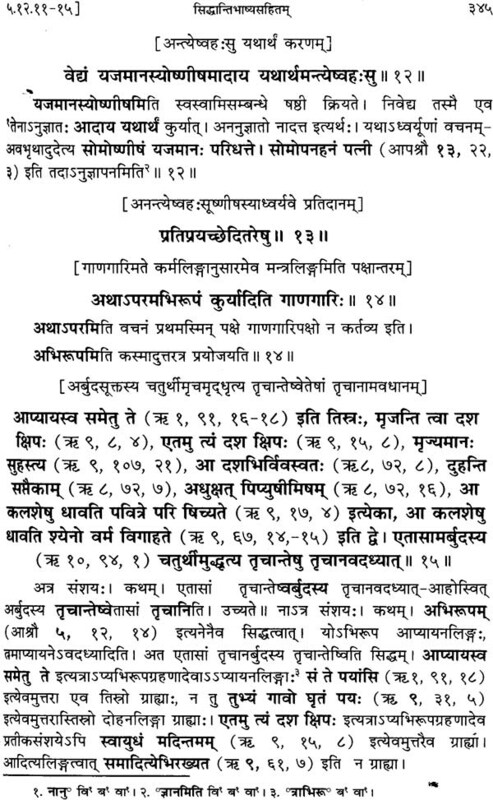 The Sankhss attributed to Suyajna commentary of Varadattasuta Anartiya and the same was published in four comprchensive, was more popular among the Rgvedins, it is evident from a number of commentaries on it. 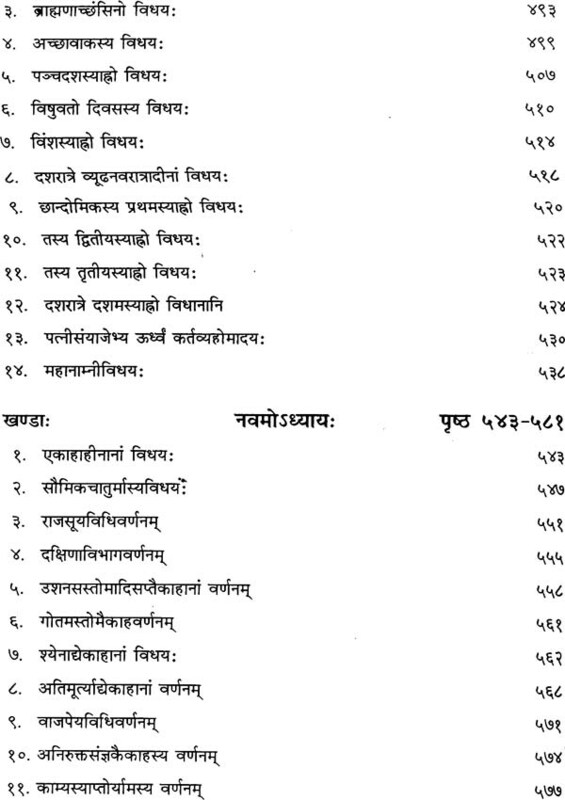 At least eight commentaries written by Devasvamin, Gargyanarayana, Bhavanaga, Siddhantin, Devatrata, Tippubhatta, Tryambaka and Sadgurusisya are said to have existed. 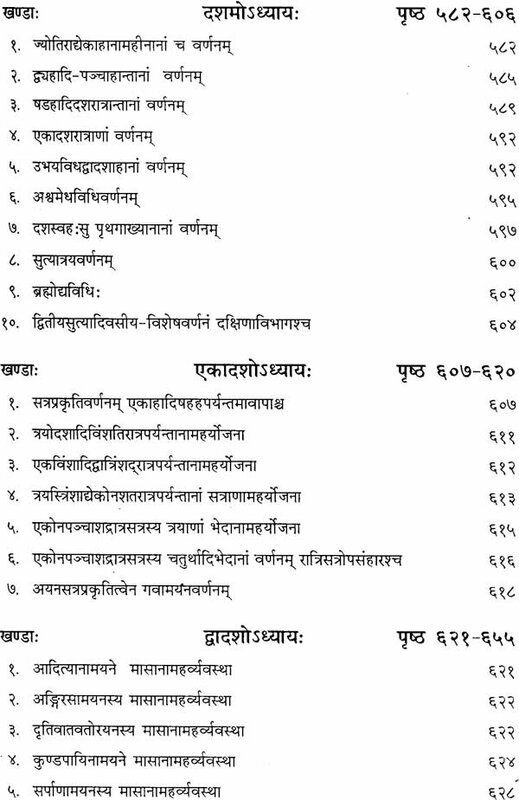 Out of these eight commentaries, the commentary of Gargyanarayana, son of Narasinha was published, one from Biblotheca Indica, Calcutta (1964-1874) under the editorship of Ramanarayana Vidyaratna and the other from Anandasrama, Poona (1917) under the editorship of Ganesh C. Gokhale, in 1962 our Devatrata, Devasamin, Siddhantin and sadgurusisya, the Asvss with the commentary of Devatrata was completed first and the same was published in three volumes under Panjab University Indological Series Nos 31 (1986). In the Introduction to the third volume the following topics were dicussed in detail. 3. Division, arrangement and number of the sutras. 7. 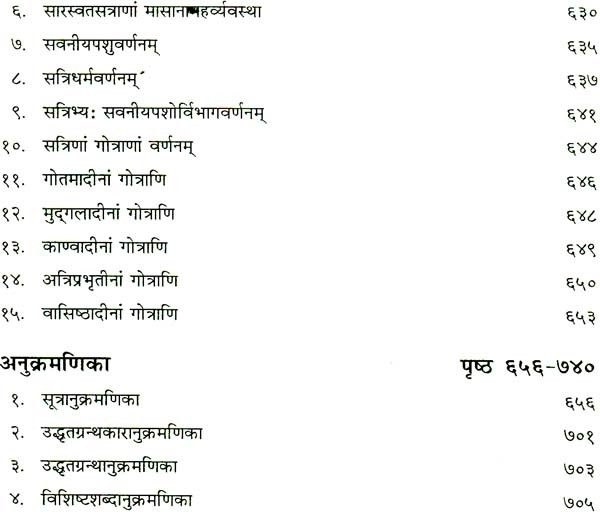 Special features of Devatrata's Commentary. After Devatrata's commentary the publication of Siddhantin's commentary commenced some two years before. Now, it is being brought out for the first time in it's entirety. As a considerable amount of discussion about the Asvss has already been made in the introduction of the said edition of Devatrata's commentary, now we shall discuss here only with some of the important features of the Siddhantin's Commentary. I.	Siddantin was Rgvedin Brahmana. His own Sakha was Asvalyana. Whenever he uses the words Vyam, asmakam or asmadiyah he means the followers of asvalayana recension. 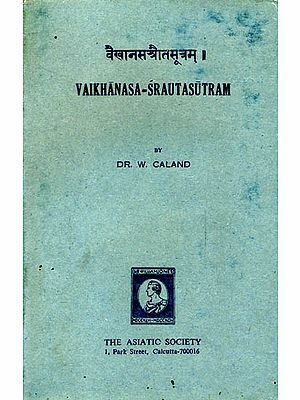 He did not belong to Kausitakin or Sankhayana recension, it is evident from the frequent quotations from the Sankhss with the phrase Iti Kausitakindam api vacanam. Had he belonged to that school he would not have used such phrase. At one place he has used the words Kausitakinam and Asmakam together. II. 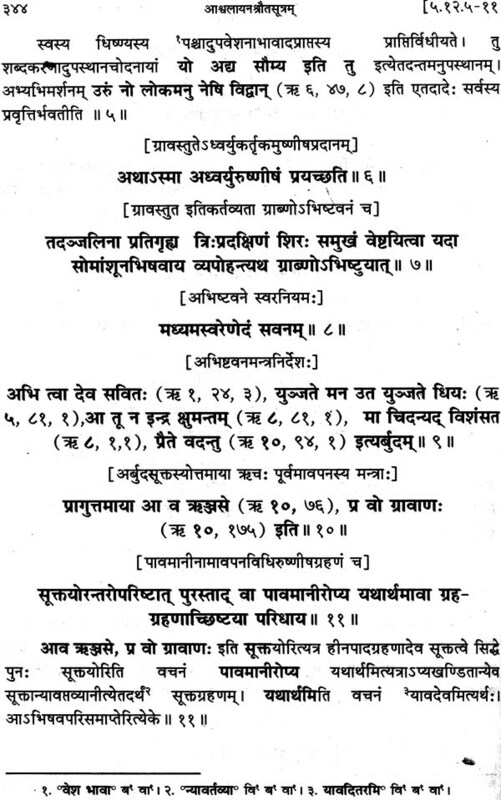 Siddhantin quotes the views of Skandasvamin and Mathuropadhyaya on the matter of employment of mantras in certain ritual. From reference to Skandasvamin in his commentary it is abvious that Siddhantin is posterior to the former. Skandasvamin flourished in 7th century. He must have flourished after that.